We are sailing down the river of memories and have called in port to view this old archive photograph of Tonsberg in Norway which is brought to us by the Flickr Commons stream of VESTFOLDMUSEENE, NORWAY. For the sepia themes amongst us there is a dockyard of potential themes : harbours, boats, warehouses and the whole concept of looking down on things. Whatever theme you choose to go with - or even if you are themeless and fancy-free - all you have to do is to post your post on or around Saturday 31st January 2015 and add a link to the list below. Before you take an overview of your archive images, have a sneak preview of the themes that are just around the bend in the great Sepia River. Regular readers will know that we are currently trotting our way through the various archive collections available via the Flickr Commons initiative. 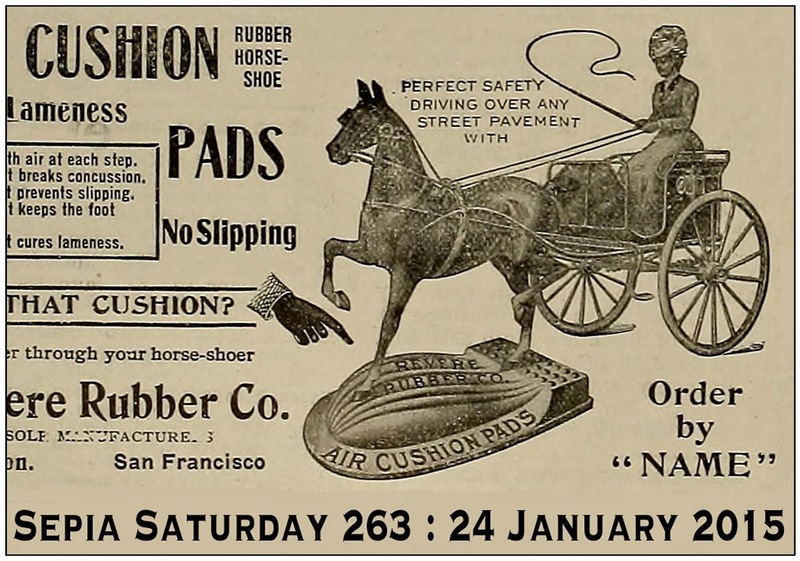 This week we have arrived at the Internet Archive of Book Images and, in particular, an illustration from the 1882 volume "Breeder and Sportsman" which is advertising air cushion rubber pads. 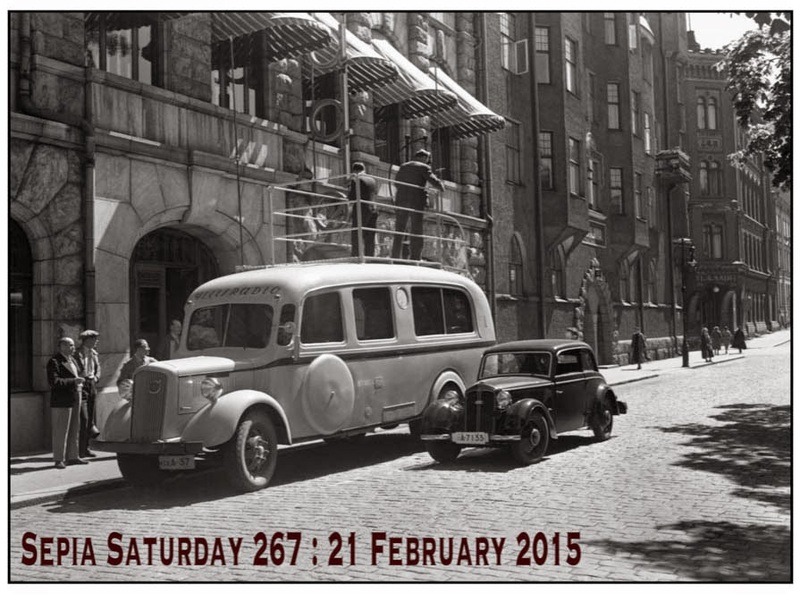 So for Sepia Saturday 263 - post your posts on or around Saturday 24th January 2015 - we invite the themers amongst you to look out your old photographs which feature adverts, horses, carts or any variety of strange and curious objects. Before you canter off in the direction of your weekly Sepia Saturday post, cast an eye over what is to come in the next couple of weeks. That is all for the future. We don't want any slipping. Get out your air cushion pads, post your post and then link it to the list below. Order by name - and the name is Sepia Saturday. We continue our journey through some of the image archives that make their content available via Flickr Commons, arriving in France, and more specifically at the archives of the University de Caen Base-Normandie. 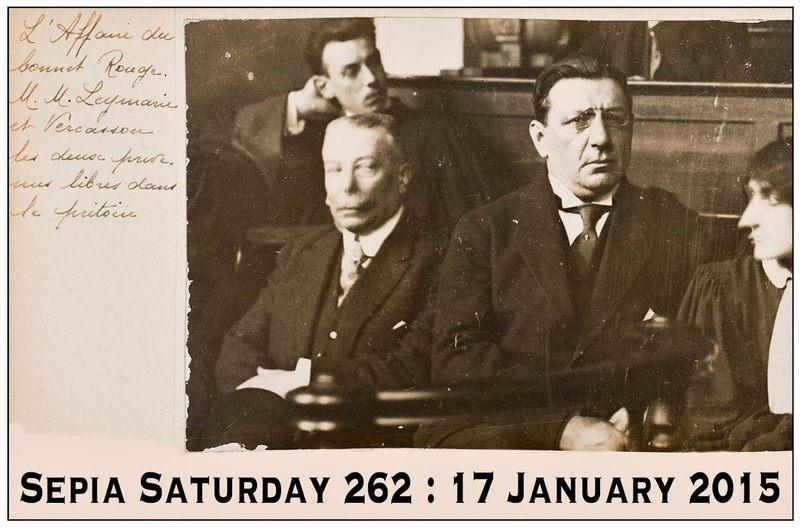 Our theme image this week comes from a series of courtroom photographs taken during an early twentieth century trial relating to the affair of the Bonnet-Rouge. You don't need to worry too much about the affair itself - there is an article about it in the French edition of Wikipedia if you are interested - but you might like to follow the legal theme for Sepia Saturday 262 (post you posts on or around Saturday 17th January 2015). Alternatively you might want to look at old photographs with writing on them or, indeed, any other theme twist on the image. Post your post, add a link to the Linky List below and review the evidence from other Sepia Saturday participants. But before you reach your verdict, why not take a look and see what lies ahead for the rest of the month. Such things are for the future, for the moment ladies and gentlemen of the sepia jury, consider your verdict on Sepia Saturday 262. If you think that our theme image this week is a little, shall we say, "odd"; you should have seen the alternatives! You will recall that I am starting the new year by doing a trawl through the various archives available on Flickr Commons, and this week I have arrived at American National Library of Medicine stream. The only description of the illustration in question is as follows: "Image of a lithograph from Hebra's Atlas, pt. 10, pl. 7, showing a man in red shirt whose face is completely covered in brown hair". 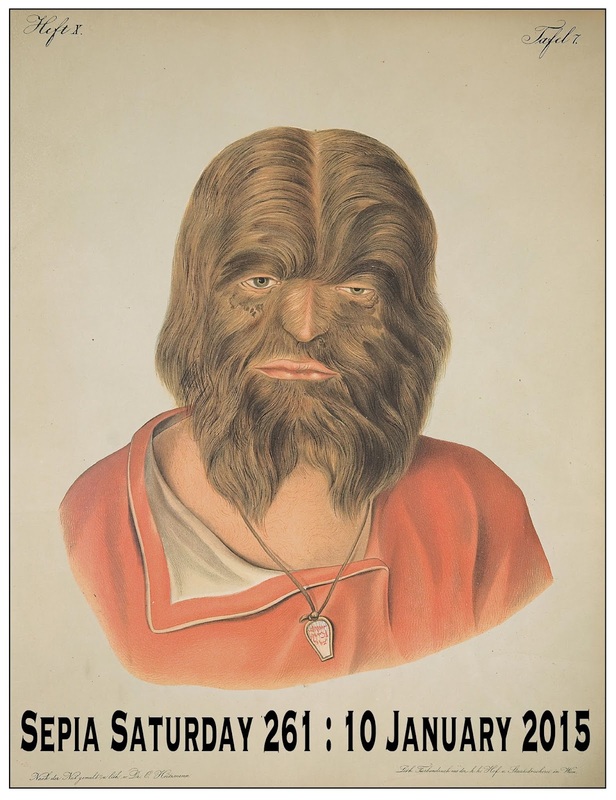 Sepians who wish to theme-along can "let their hair down" with this one going with unflattering portraits, beards, hair, lockets, medical conditions or red shirts. All you need to do is to post your post on or around the 10th January 2015 and then add a link to the list below. 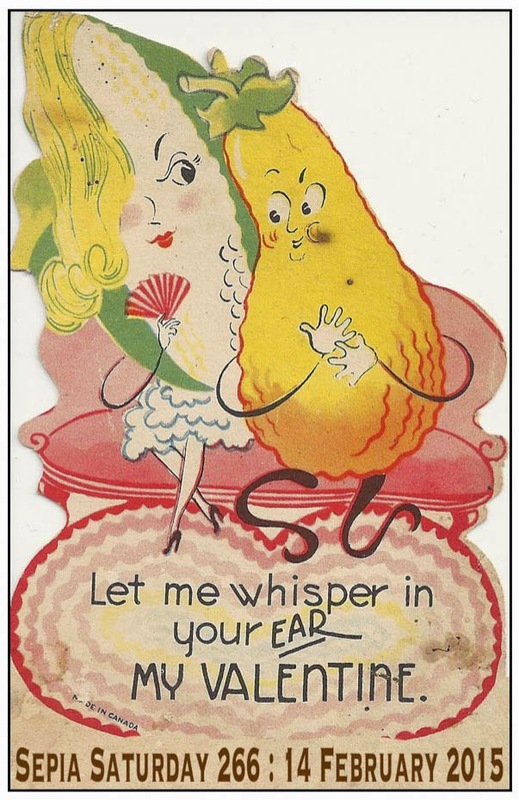 But before you start pulling your hair out as you search for a possible match to the hairy man with the red shirt, here is our usual preview of the next couple of Sepia Saturday calls. 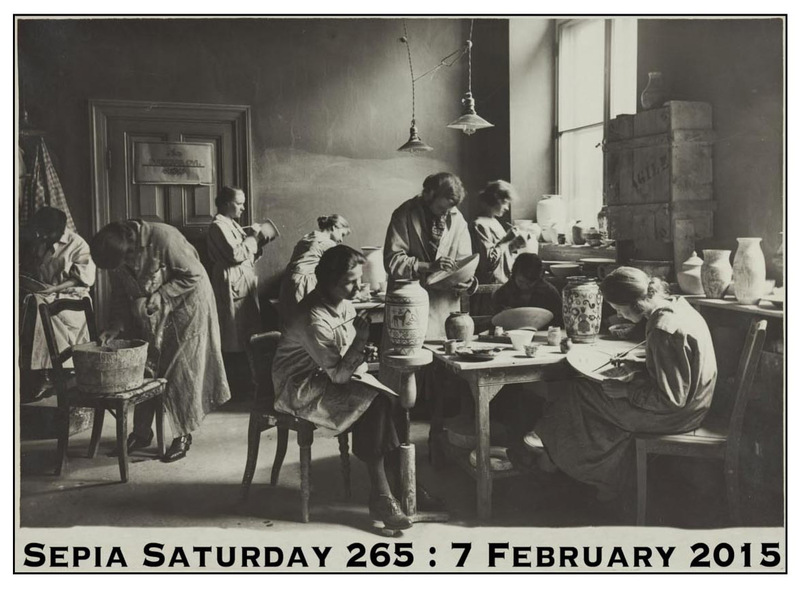 Those are for the future; for now search out that old photograph of Great Aunt Ruth-Annie with the hairy upper lip, or Cousin Colin with the half-hearted beard and join in with Sepia Saturday 261. 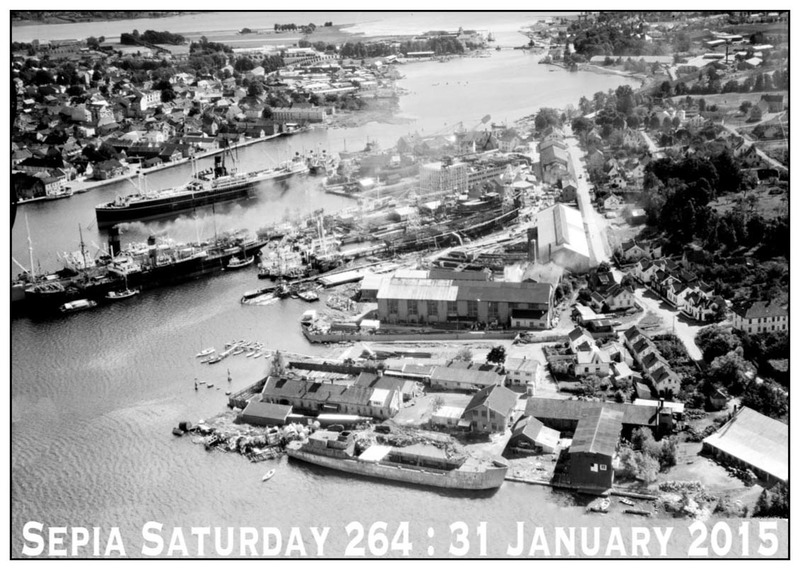 Launched by Alan Burnett and Kat Mortensen in 2009, and administered by Alan, with help from Marilyn Brindley, since 2011, Sepia Saturday provides bloggers with an opportunity to share their history through the medium of photographs. Historical photographs of any age or kind (they don't have to be sepia) become the launchpad for explorations of family history, local history and social history in fact or fiction, poetry or prose, words or further images. If you want to play along, all we ask is that your sign up to the weekly Linky List, that you try to visit as many of the other participants as possible, and that you have fun.